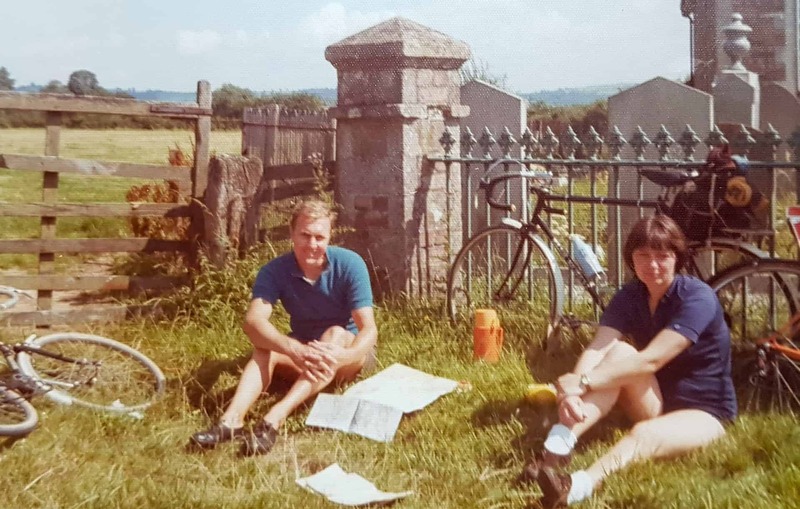 Extracts of a recorded conversation with Cath Mansell talking about her late-husband Bob and his passion for cycling. Bob was born in Smethwick and he never left. he only lived in three houses during his lifetime. He was into cycling from the time he was 12 months old because he was in the sidecar of a tandem bike that his mom and dad were on. And they went to Wales every single year from when he was twelve months old. So he was on a bike from the day he was twelve months old until he died. His life was bikes. 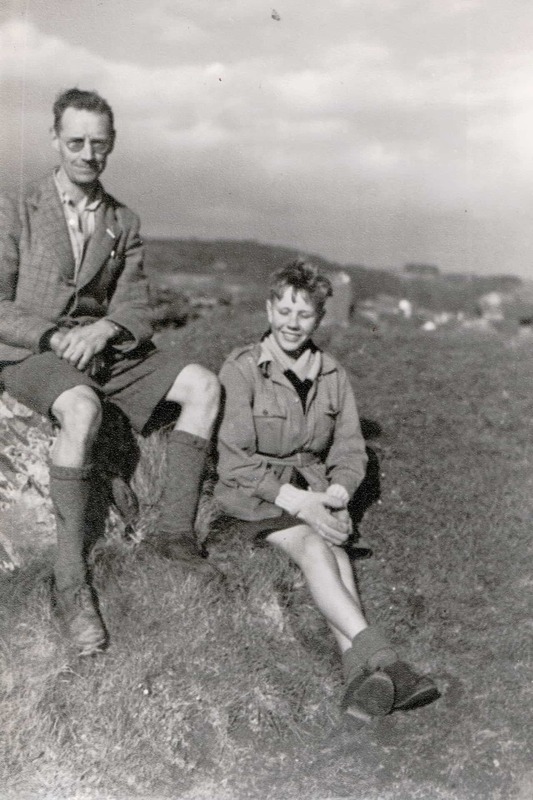 This is one of the many holidays that Bob and his family spent at Barmouth in Wales. In this picture we've got Bob and his dad. Bob looks to be about 12 years old there. 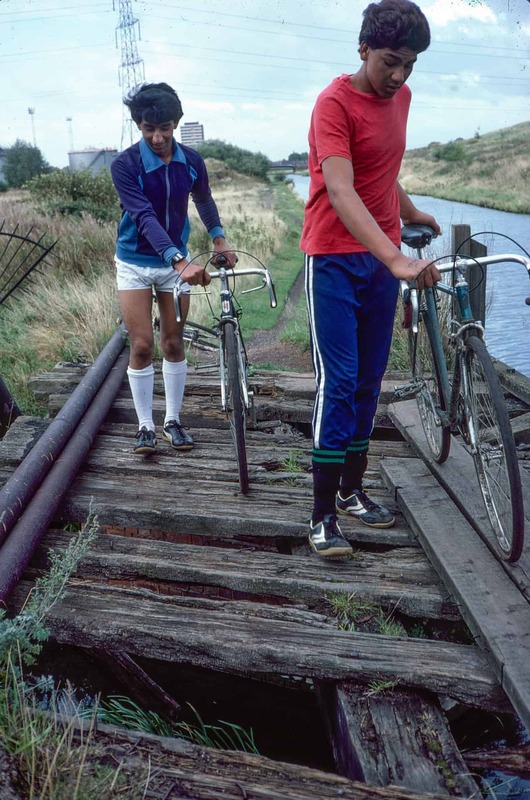 Both of them in typical cycling gear of that period, making them look really old-fashioned. 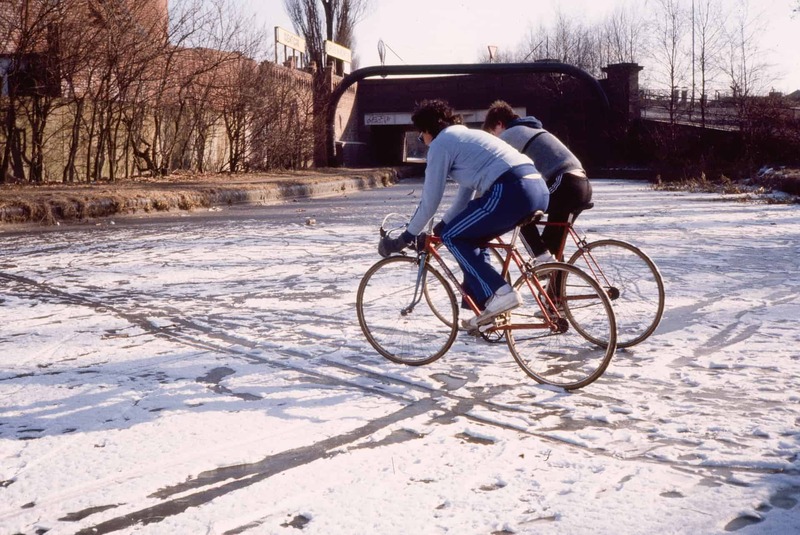 They would have been cycling and then got off the bikes and had a walk around. The bike was definitely the centre of all his life. Nothing else mattered. Anything went wrong he just jumped on his bike and go off for a ride, then he would come back and he’d got it all solved in his head. 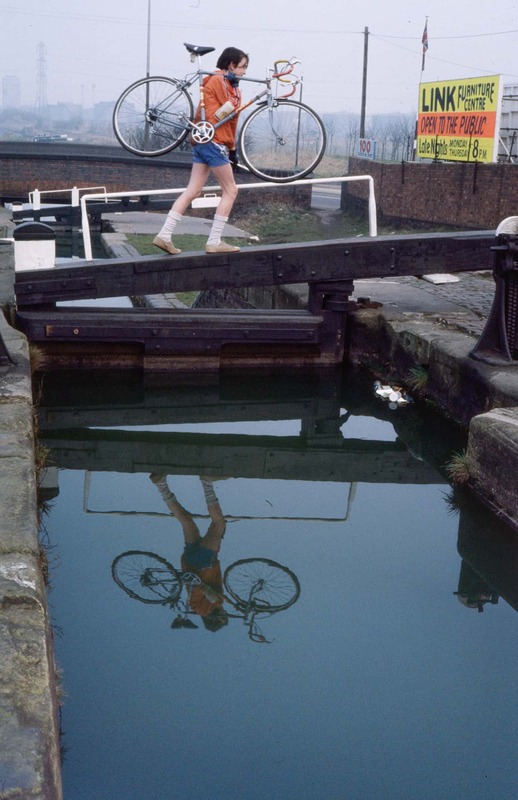 He was always cycling and once he had found a camera, well everywhere he went the camera went with him. So on all of his holidays abroad, and while he was out with the boys he took photos. 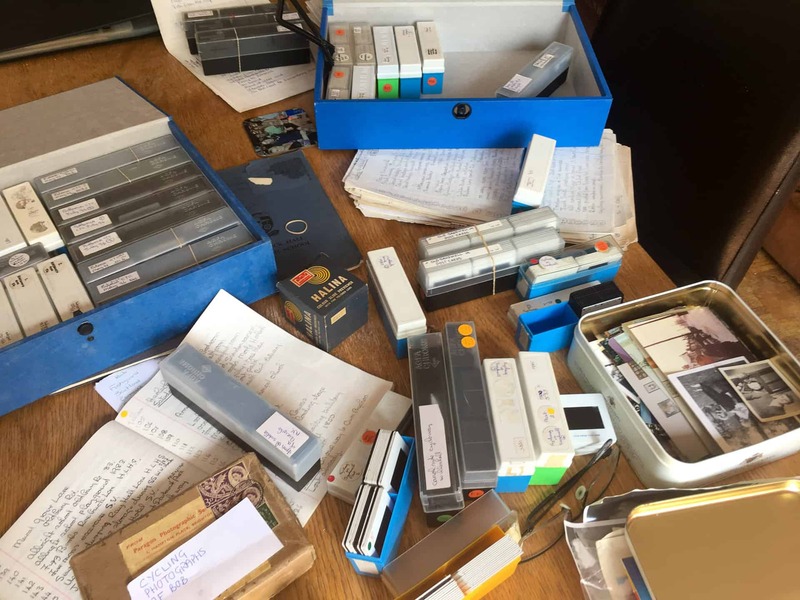 While he was ill we did actually get rid of hundreds of slides because he had just sat there saying: "nobody will be interested in these." So we chucked hundreds away. But I had got the bookcase the lower half of a bookcase filled with hundreds of thousands of slides that I had to go through. 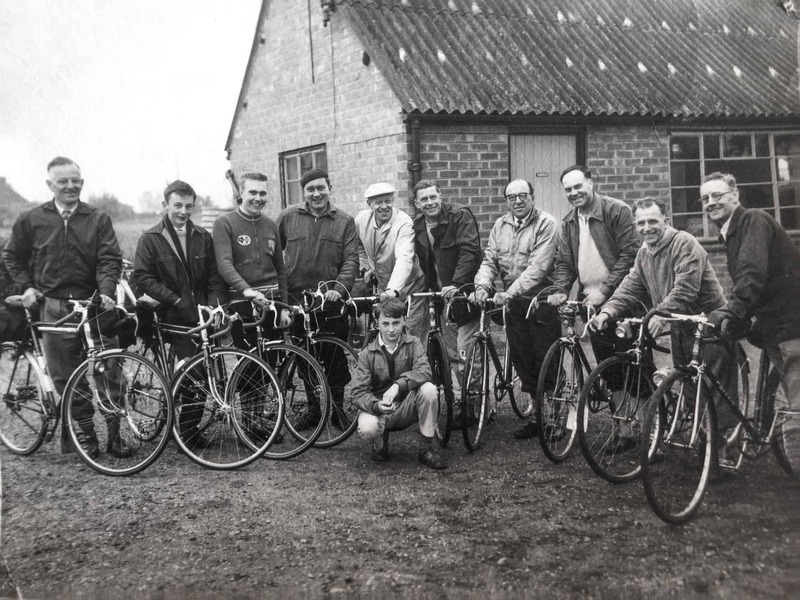 Probably Oldbury Cycling Club late 1950s. 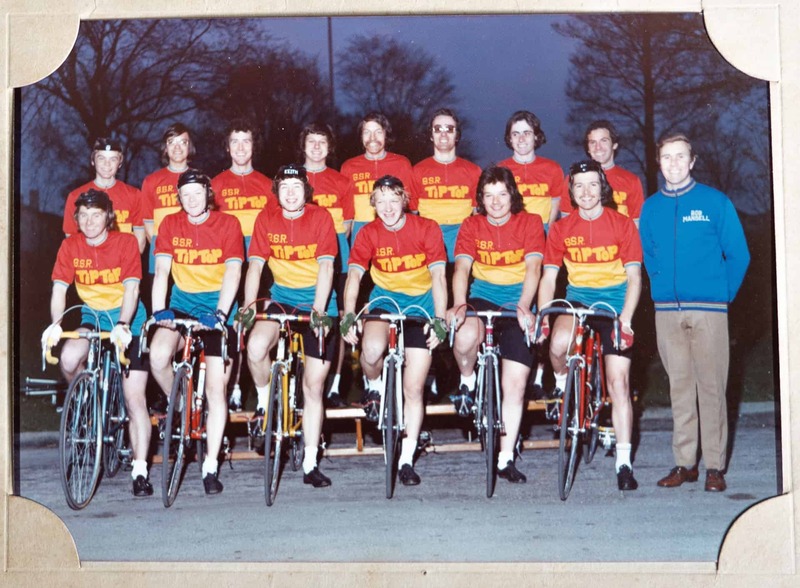 Bob Mansell isthird in on left, his father Robert senior is 1st on the right riding the Falcon bike. He was born in 1936 and we got married in 1960. 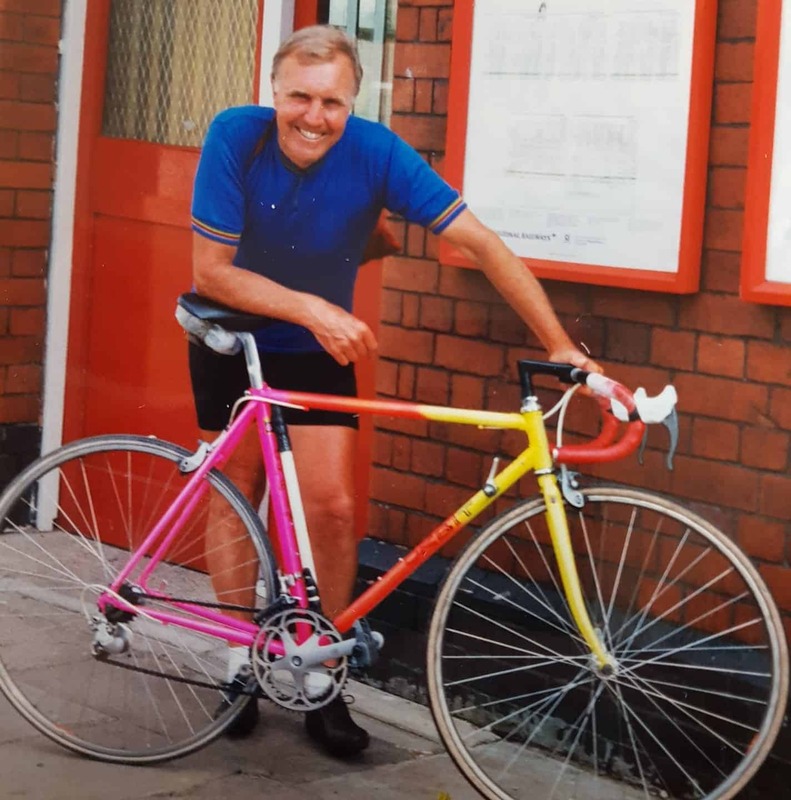 He'd already been running the cycle shop in Oldbury Road which he inherited from his grandmother and prior to that his grandfather, when it was a second-hand shop. His grandparents were down-and-out, got no money at all, but they had got a barrel-load of books. So he took this barrow-load of books this shop in Oldbury Road became a bookshop and a secondhand shop and he was really really good at it. 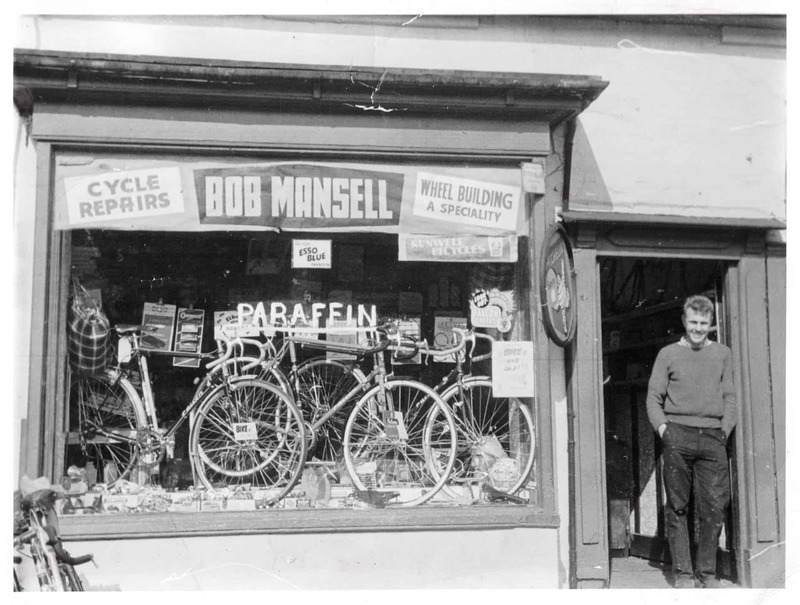 His grandfather had got a few bits and bobs of cycles in the shop, but once he died Bob went in and it became a bike shop. So that would have been 1958. I met him at a coffee house on the way to Birmingham. Going down from Smethwick down the Dudley Road Hospital there was a cafè called La Fiesta and everybody used to go there for coffee. That was our recreation. So I met him there and I told the biggest lie ever because he was into jazz and Ella Fitzgerald and all that, and I said: "oh how I love Ella Fitzgerald." I'd never heard of her in my life but he thought that it was wonderful that he'd met this girl that liked Ella Fitzgerald. Well, the marriage lasted for 45 years so I think he must have liked me! 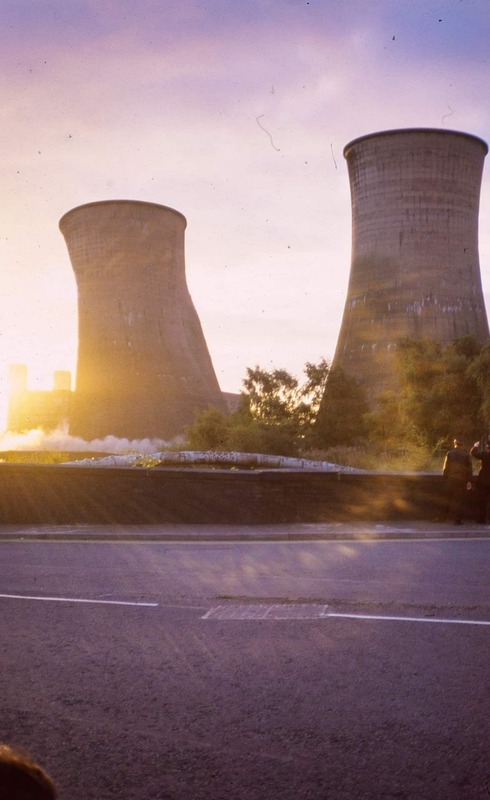 Four photos showing the demolition of the cooling towers at Ocker Hill Power Station, Tipton. 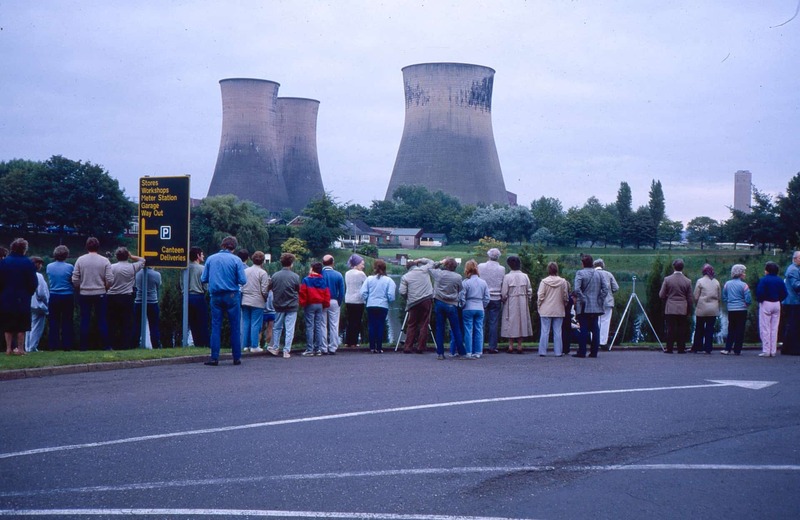 They were demolished in controlled explosions, No 3 on 18 August 1985 and Nos. 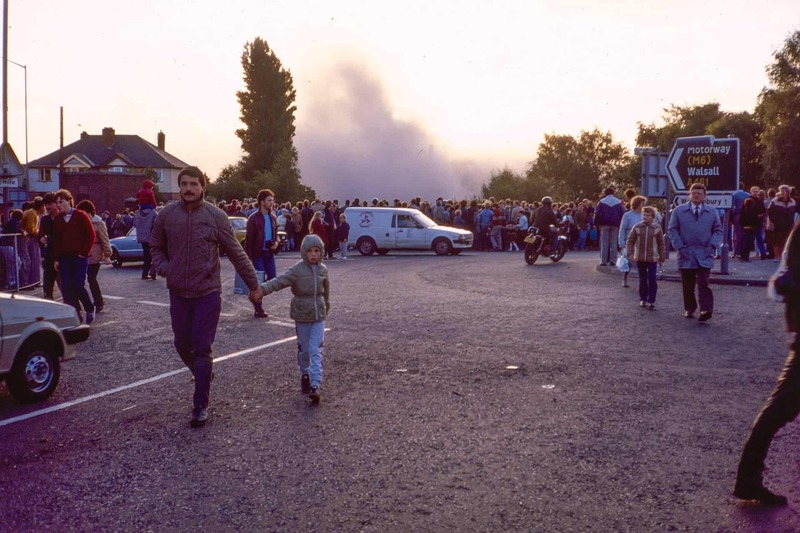 1 and 2 on 15th September 1985. 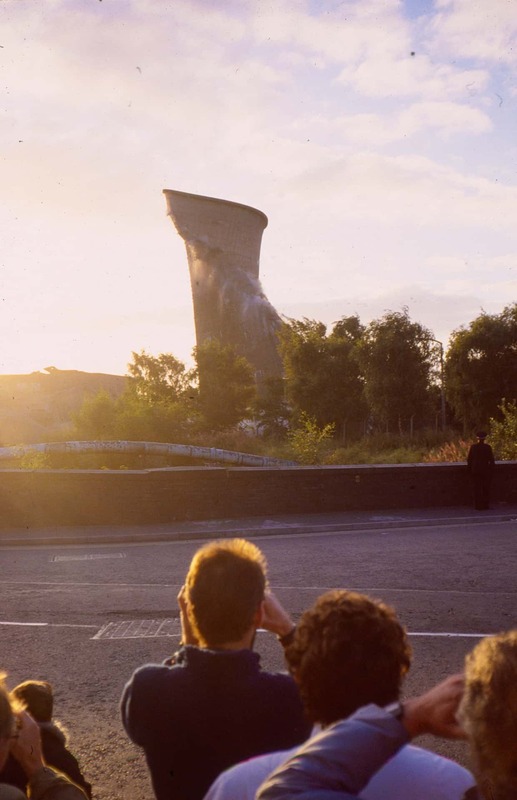 We went to the see the end of the cooling towers at Ocker Hill Power Station. Anything that was happening that was a little bit out of the ordinary - or even the ordinary things - he was just interested in everything. The bicycles, the railways, steam engines, the canals the botany, the birds, anything could take his interest. He would get enjoyment out of observing things. We were happy and contented together. I'd got my own interests as well and my own friends away from the cycling. So we both did what we wanted to. And then we both came together and did things together and enjoyed doing that and I think sometimes it makes for a better life because you've got so many interests to talk about other than staying at home and doing nothing. 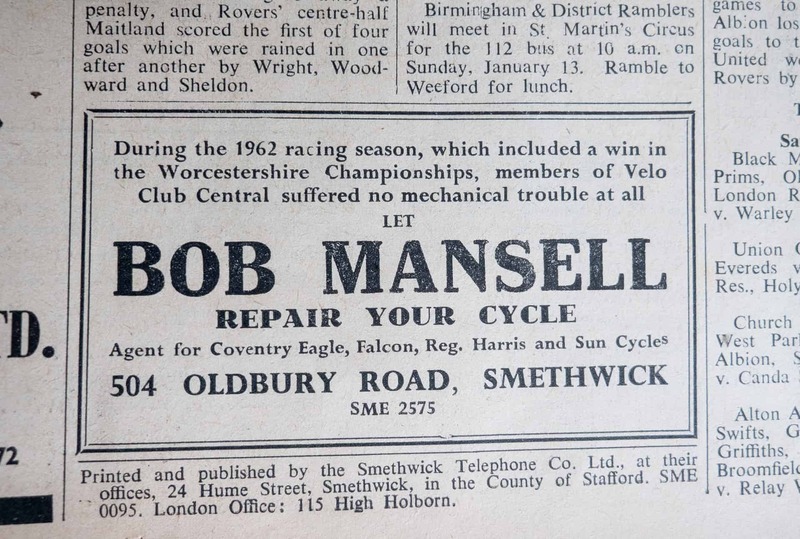 Bob Mansell Cycles 504 Oldbury Road, Smethwick, Staffs. 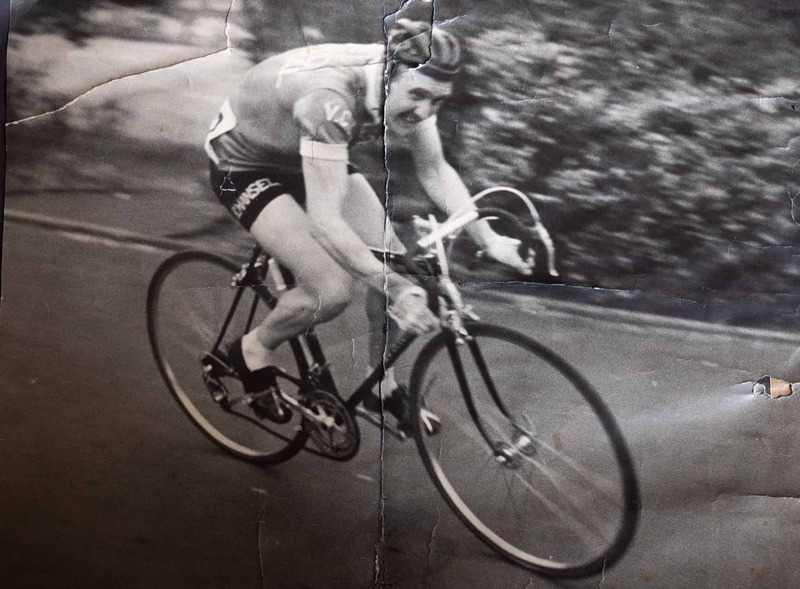 Bob's daughter Juanita remembers "Falcon bikes, probably Brookes saddle in the window. Grandad and dad used to sell Esso Blue parafin out of the back of the Morris Traveller. The floor boards were bare and there was a cellar with an opening at the front of the shop. Dad was always repairing wheels in the back, I remember the big tin tubs of lube and ball bearings rolling around, they were so little." It was quite a famous shop. Well, he was quite famous because he was doing so much for cycling in the area and there weren't a lot of people doing it. And he used to do lots of things for the kids as well. So there weren't that many people that were prepared to organise the races. Consequently, he was well known all over the place. 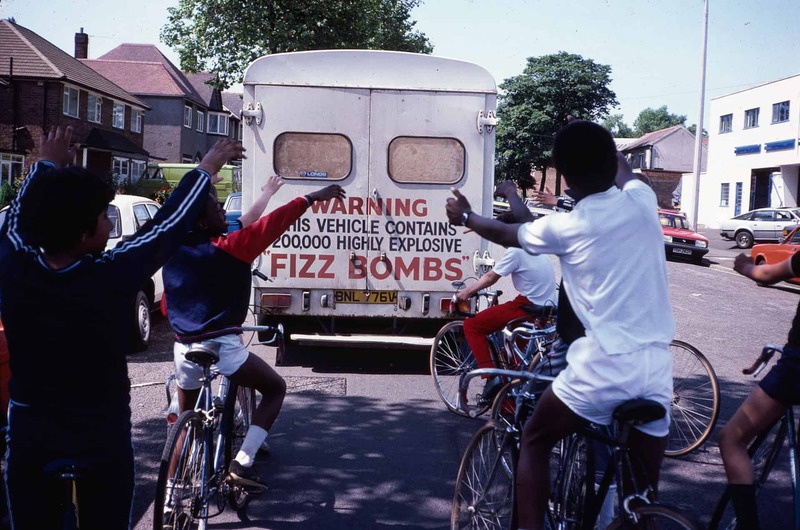 In the 1970s he started going into schools doing road safety to do with bicycles. The organizations was ROSPA (Royal Society for the Prevention of Accidents). 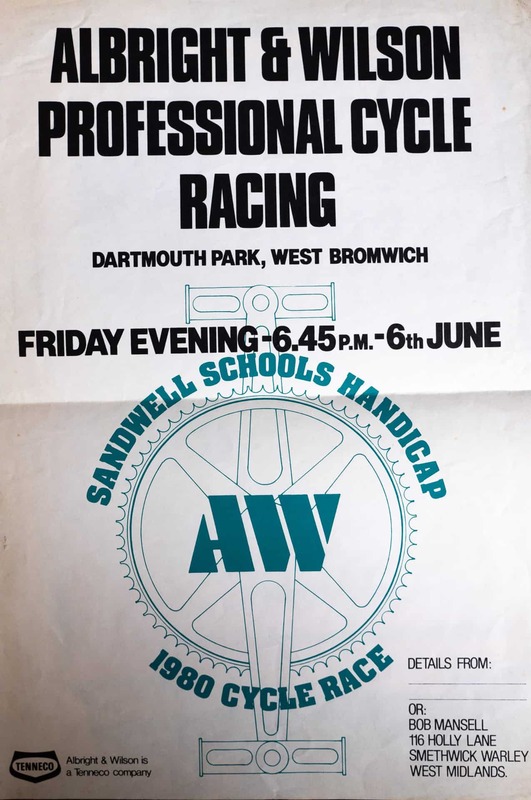 It was so popular that the 'cycling in schools' followed on from that he was asked to teach in the schools full-time which is what he did until he retired in 1987. 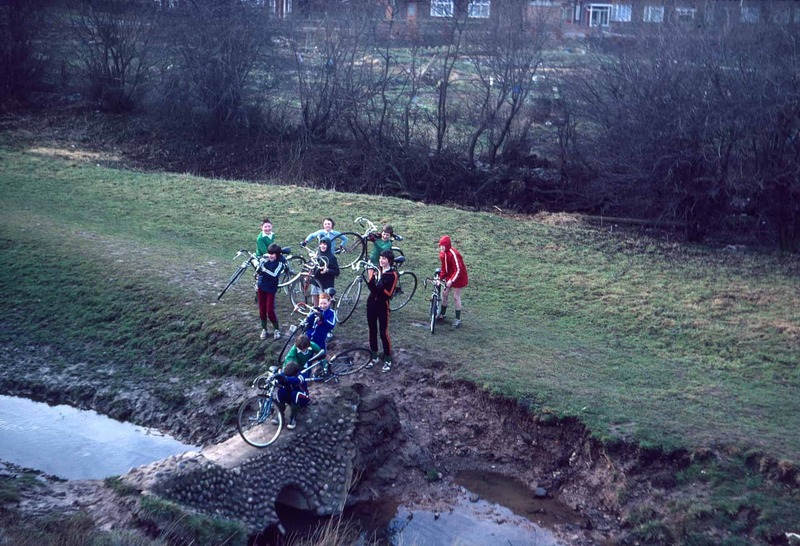 He would be taking the boys out and they used the canals a lot because they were easy to access from the majority of schools around by us and you hadn't got any of the traffic. 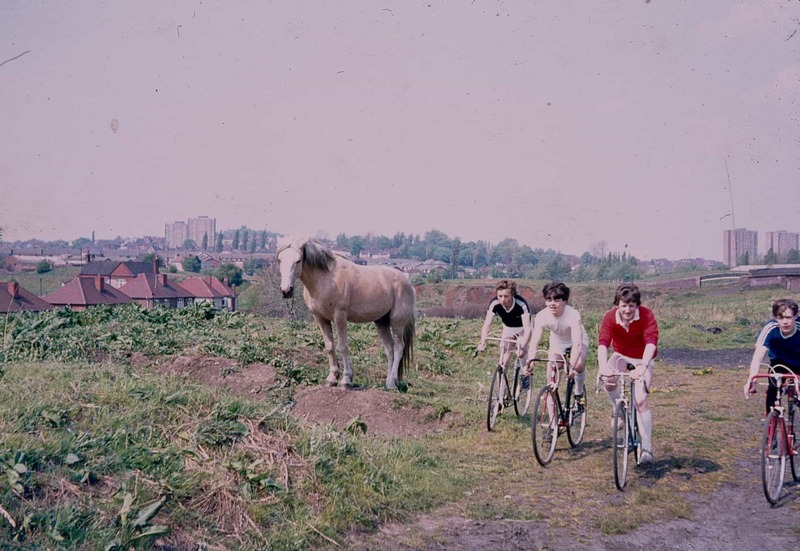 And there was there was lots to learn, lots for him to teach the boys - the industrial areas, the industrial heritage that we have got in Smethwick and around. And he'd love taking photographs of reflections so he set these sort of things up just to get that beautiful reflection. Bridge at Tividale Locks. 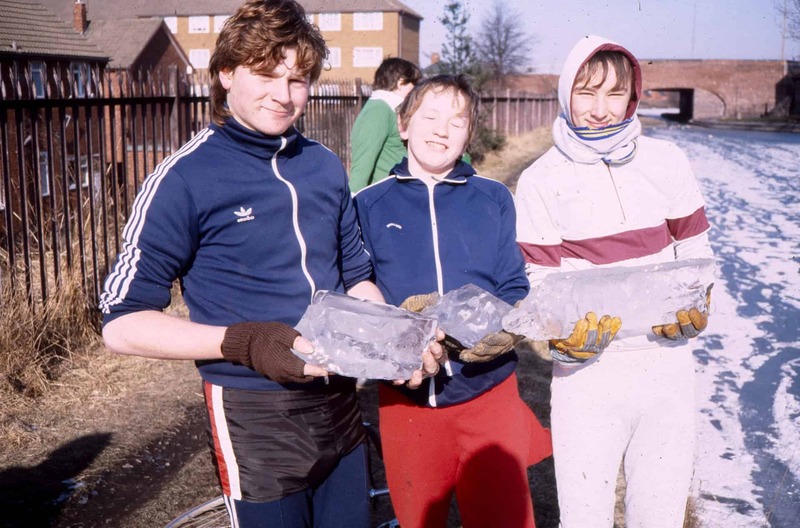 with boys from Holly Lodge High School. The kids just loved going out with him, because they would just learn so much about the local geography, industrial areas, the birds, flowers and so. They'd pick up a great deal of knowledge and they would take it back to school and bring it into the school lessons. They wouldn't have seen these things in their everyday life going backwards and forwards to school. So he was taking them to places they wouldn't otherwise have been aware of. I thought he was wonderful. He was very friendly, he'd go out to buy a newspaper which is five minutes away, and three-quarters of an hour I'd be thinking: "where is he?". And he would just be talking to someone. He knew the postman by name, he knew the milkman by name, knew the coalman by name. He would stop and speak to everybody. he was just a very outgoing, friendly person. He had a good sense of humour, but he was fairly strict and had his own ideas about things. Keeping to the letter of the law. He hated cars, he never wanted a car. 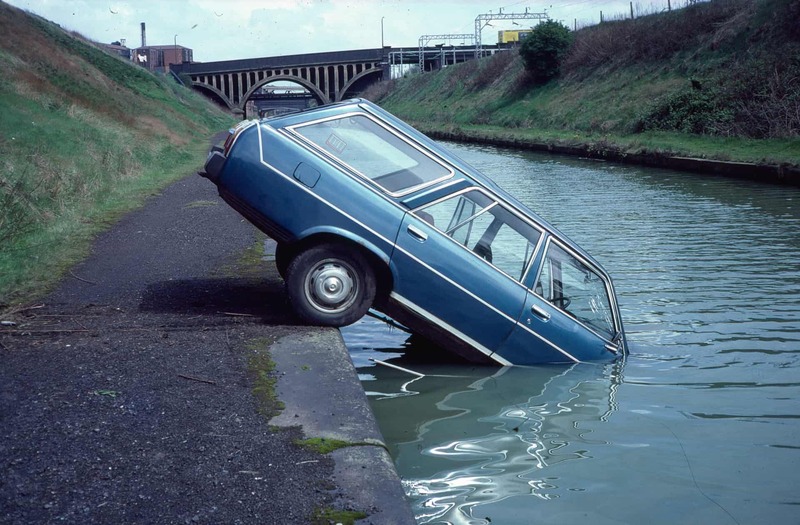 He was always environmentally minded. Boys showing the thickness of the ice on the canal. 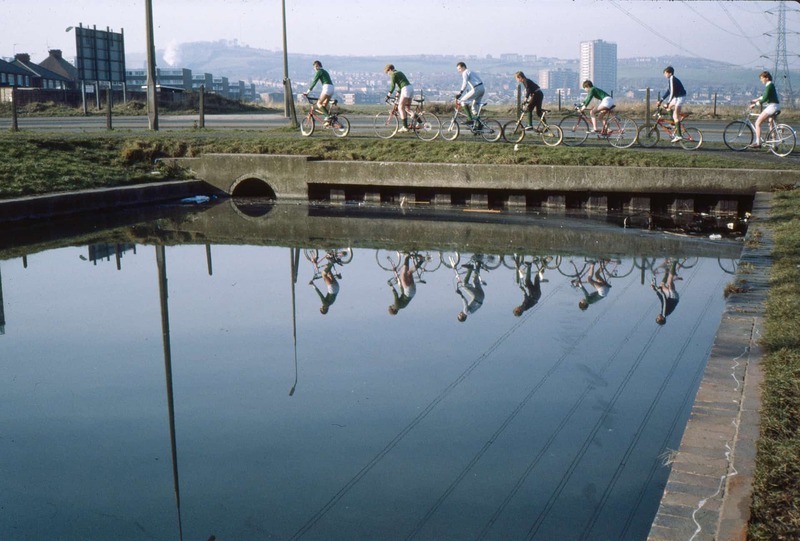 Boys cycling along the canal. He loved his work so much. I used to come home from work and as soon as I come through the door he would be: "guess what I've seen today,. guess what's happened today?". And I would be: "Please, let me have a cup of tea first and then you can tell me!". He was involved in them getting the boys at school to plant acorns and plant chestnuts and to create little bits of woodland. He would create that interest within the boys. And I'm sure that with a lot of them it has carried on into their later life because the letters and comments that I've had from people who met him said 'he changed my life'. And he did change a lot of people's lives or made them think differently. He loved his life. 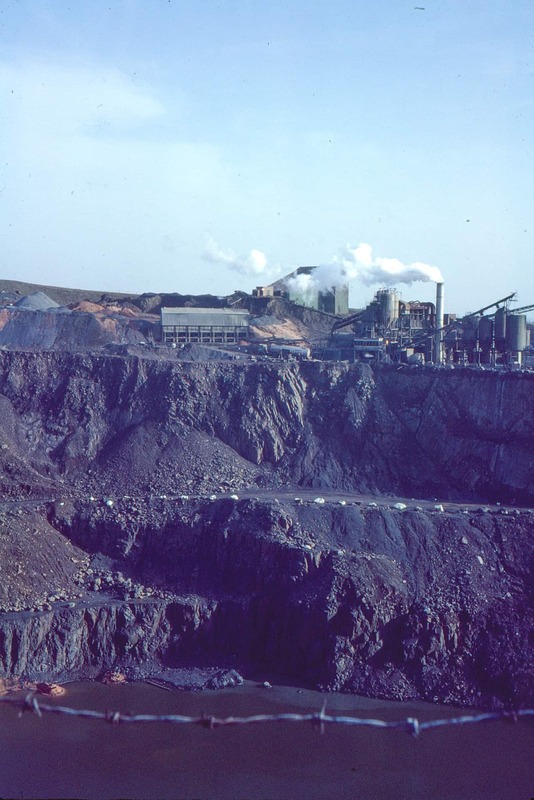 He just couldn't imagine how other people lived their lives doing jobs that they hated in factories while he was in a school, teaching young people how to appreciate life and the countryside. And he just loved it. He knew how lucky he was and he always said that. And I think sometimes he used to think 'it can't last' but it did. it did. And he was happy and cheerful all the time even when he was ill as well. He never made any fuss about it whatsoever. He was born in 1936 and he died in in 2005 when he was 69. Bob Mansell at Smethwick West Station in 1990. 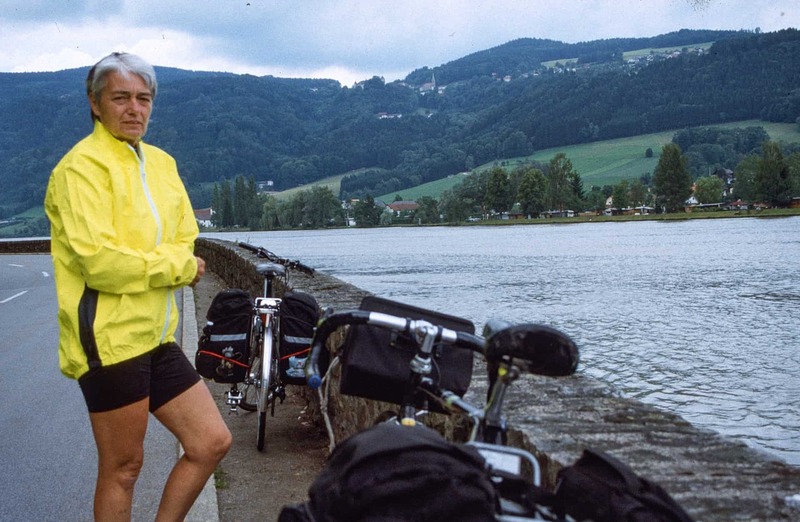 Cath Mansell cycling along the Danube in Germany with husband Bob June 12 -26 2004. From Bob's diary: "What an adventure for us. So many new things, new friends etc. Cyclists by the hundreds. Flowers by the hundreds". He had a 'fairy tale life' - that's what he used to say. He's got that on his book of memory: fairy tales can come true. Well, fairytales do come true.